Us Weekly reports that revealed that Ciara and Future are no more. According to a source claiming to be close the the “I’m Out” singer, CiCi called off the engagement after learning that Future had been unfaithful. “He cheated on her. Game over,” one source said. “She’s devastated. Ciara’s focus now is the baby,” added another. In the article, it is currently noted that the interview was conducted prior to news of the breakup leaking; however, it’s unclear it the gossip pub’s initial report made that clear. Nevertheless, once CiCi got word of how the story was being framed, she quickly took to Twitter to call them out. “@UsWeekly I did not do this interview with you! This is a lie, and tasteless! Must you be that thirsty to create a story?! Unbelievable,” she tweeted. 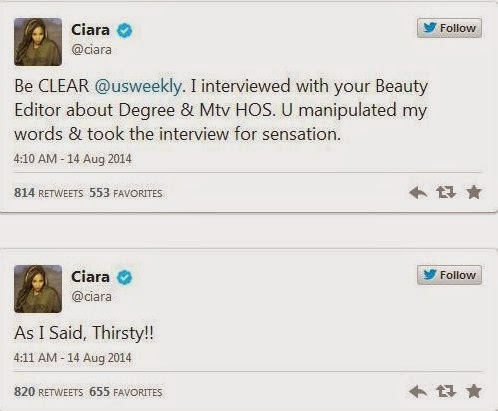 What’s interesting to note about all of this is that Ciara did not refute breakup claims made by the magazine.